Below: The one millionth object reported to Britain’s Portable Antiquities Scheme. The British Museum has released further details to the Archaeology Hour on the massive Roman Coin hoard found in the UK near Seaton Down with a metal detector in 2013. Vincent Drost, the Museum’s Project Curator for Romano-British coin finds said in a lengthy interview that the coins shed light on the Roman monetary system and the various mints that provided coins to the forces that occupied Britain for five hundred years. 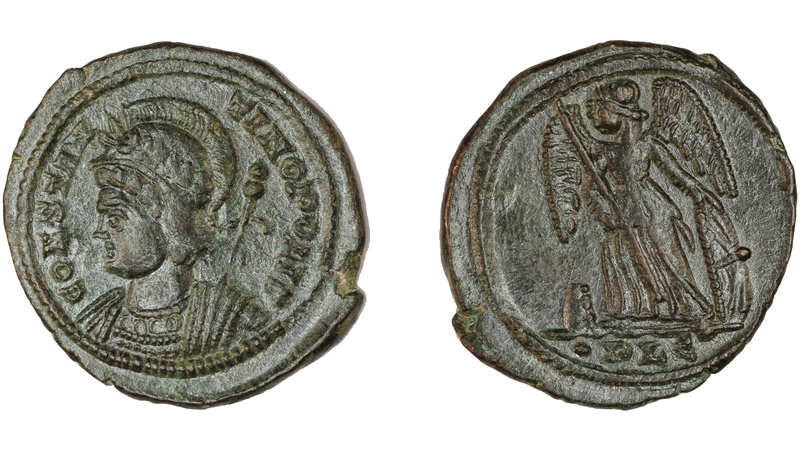 The find was one of the largest hoards of such coins ever found in England—it also contained the one millionth object reported to the country’s “Portable Antiquities Scheme,” a government program at the British Museum to encourage the voluntary recording of archaeological objects found by members of the public in England and Wales. Laurence Egerton made the find in November of 2013 at Seaton Down in Devon, UK. More than 22,000 coins were unearthed near the site of a Roman fortification and a Roman villa. Since that time the coins have been cleaned and turned over to Dr. Drost for study. “With more than 22,000 coins, Seaton Down is definitely one of the largest hoards of the 4th Century AD found in Britain. It is also one of the largest hoards of 330s-340s recorded within the Empire, together with another British find, Nether Compton, Dorset, 22,703 coins” said Drost. Cunetio, Wiltshire: 54,951 coins in two vessels. According to Drost the coins in the hoard represent the work of many Roman mints throughout the Empire. Just a few of the coins were minted in the UK, the majority were minted in France (Gaul) and Germany (Trier) and even places as far away as Antioch, Turkey and Alexandria, Egypt. Work on the coin hoard continues at the British Museum, “In the space of a year, the 22,000+ coins were cleaned by Pippa Pearce (Department of Conservation) and fully catalogued by Richard Abdy (Department of Coins & Medals) and myself (Department of Britain, Europe & Prehistory) in the British Museum. A preliminary report is available on the PAS database (finds.org.uk: ref. PAS-D7EA4C). The detailed study is a work in progress. The first results of this study will be presented at the International Numismatic Congress that will be held in Taormina, Italy in September 2015,” said Drost. The most intriguing question about the hoard still remains unanswered: why were the coins buried? “The barbarian invasions, among other political troubles, were traditionally blamed to explain hoarding. Ancient texts tell us that Constans (AD 333-350), risking a dangerous winter voyage, paid an unexpected visit to Britain in AD 343. This visit might possibly be related to troubles caused by the Picts on the Northern frontier. But the situation of Seaton, on the South West coast of Britannia, makes this explanation unlikely. Hoards were also buried during times of monetary reform. The hoarding in Seaton ends with the first issues of the new reverse type VICTORIAE DD AVGGQ NN. Nevertheless, the weight and metal composition of the new coins were similar to that of the previous nummi (reverse type GLORIA EXERCITVS) and there was no reason that we know of to save the older coins. “A three square meter area around the find spot was exposed but no archaeological remains were discovered. The only significant non-coin objects were three Roman iron ingots arranged on top of the coins. The coins were laid in an isolated pit and were contained in a flexible bag made of textile or leather. The excavation revealed two small bags of concreted coins within the main deposit. Presently, it is difficult to provide a specific explanation for the burial. The hoard could possibly represent the savings of a private individual, the wages of a soldier or a commercial payment. The possibility of a community ritual deposit could also be considered. We could add that the deposit was planned on the long term as it wouldn’t have been an easy task to unearth those 68 kg of coins stored in a flexible bag,” added Drost. While the Roman monetary system appears quite sophisticated, the concept of banks did not arise until many centuries later. It seems the actual reason for the deposit, and the reason why it was abandoned, may never be known. The full audio interview with Dr. Drost will appear in the second half of the Archaeology Hour pilot broadcast to be launched in a few weeks. More photographs of the find and some of the individual coins courtesy of the Trustees of the British Museum are posted here. E. Besly, R. Bland, The Cunetio Treasure. Roman Coinage of the Third Century AD, London, 1983. S. Moorhead, A. Booth, R. Bland, The Frome Hoard, London, 2010.